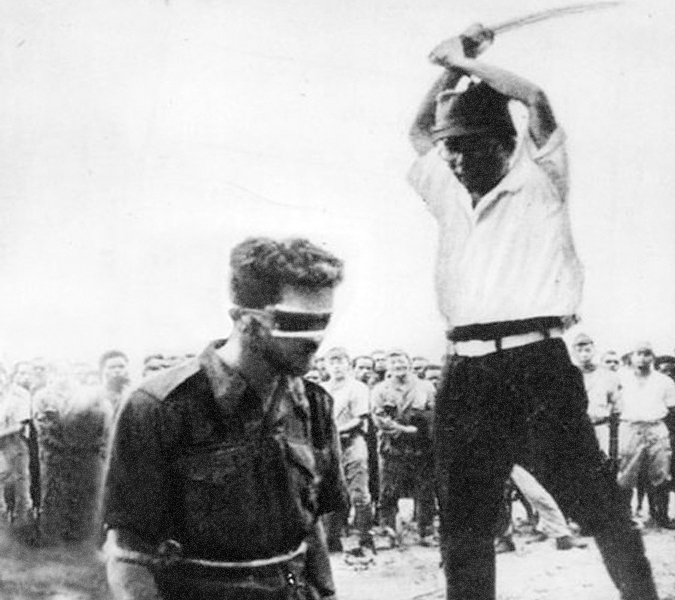 What this soldier thinks of, what others that met the same fate considered in that short time before their murder, seeing the blade that would come down on their neck, the black of the blindfold. Is it anticipatory in those seconds before? Is there reflect? All you’ve done that you will not again. All you’ve done that you may have done differently, something that hadn’t earned much thought of before but, now, when you’re living in short, re-enter. What if you could have been a teenage boy that joined the local rotary that would have a lunch packed before making down a gravel path, the sound of unsettled bits of earth shifting below rubber shoe soles and how that sound echoes off the peeling bark of thin-trunked trees, off-even rows of weak straws, reaching towards each other, some, away. What if your name was written on a white star, on a banner, with the other rotary boys, all sent to war and there would be a girl with a ring pulled off her finger for you, for a necklace, she says, for your pocket, for a rule that she wouldn’t give it to you if you wouldn’t promise her that you would come back to that very spot and put it back on her hand. You’d think where did I lose me? You’d think where did I lose a metal tube slide that boys would rumor was covered in urine because that’s what older boys did when they snuck out of the house; would drink at the playground and piss down the slides so kids would skim over its dried film on the way to the bottom, the older boys then in class or home imagining the event back and forth in humor, in shame. Would I have later been a Homecoming boy on stage with a crown and rush of heat on my neck in a suit and my father’s shoes? Would I have been an all-star with a name known the next town over? Would I remember times when I was younger and those times had impressed on me joy? Would I have later taken a tray in a college cafeteria line, would I have learned a fraternity song, would I have her, still? In that moment before, you would then be a bird high above your own head; you would be your past that leads not to just a quick end, there, in the present but runs forward, fluid, into the future. You would have memories that you don’t know, that you wish you’d forget, to be vacant, to not have something that with a swing they can end. Dostoevsky writes about the moments before execution, somewhat from personal experience since he was already in front of a firing squad before his pardon arrived – quite interesting. Unfortunately I can’t remember which of his books he buried it in. I don’t think it was “Brothers,” maybe “House of the Dead” or “Crime and Punishment.” Unfortunately it’s been a while since I read them and all those dreary Russian novels kind of blend together after a while. I’ve been meaning to dive back into my Gogol. Let me know if it ever comes back to you where Dostoevsky talks about this. Each time I read this, I’m moved by the thought of how tenuous life is and how we don’t value the opportunities to make the most of it, or even to consider every precious moment and remember it all. Isn’t that true. I keep thinking of the dichotomy of feelings one must have when knowing that they are going to die in very short time, reflecting on the joy of your blessings while being saddened by their imminent ending. One of my greatest memories is when I realized that the moment I was in was going to one of great value, meaning. It was seemingly simple, a time with my cousins, but I just knew. I’m both thankful for that moment and my immediate awareness of its importance.